As most of you probably have seen or heard, the Power BI designer now supports some of the Power Pivot features like DAX and renaming columns, formatting etc. Formula bar: Using the new formula bar in the Report view you can create measures by writing formulas in the DAX language. The formula bar helps you write these formulas by differentiating functions, fields and measures using syntax coloring, it provides intelligent function and field suggestions and tells you if parts of your DAX expression are wrong using error ‘squiggles’. It also allows you to use multiple lines (Alt + Enter) and indentation (Tab). Comments: The formula bar also allows you to write comments as part of your measures, just type “//” and everything after these characters on the same line will be considered a comment. You can also use /* to add your comment */ in the middle of a formula. Saving incomplete measures: How often are you in the middle of writing a complex Measure and wanted to ask your colleague for help but do not have a way of saving this half-written measure? The Power BI Designer now allows you to save measures that are invalid so you can just save your file and take it to your colleague, or continue to work on it another day. New DAX functions: New functions are added like Percentile, Median, Contenate, XNPV. For the full list check out this help topic. 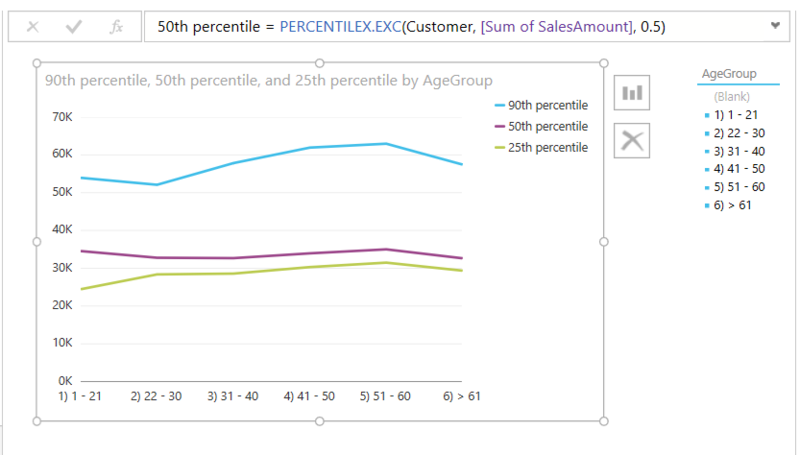 For the full list check out the Power BI blog post that talks about all features. Pretty excited about this! and I hope you are as well :). I will be blogging on some of the use cased for some of the DAX functions soon. Next PostDAX now has variable support!